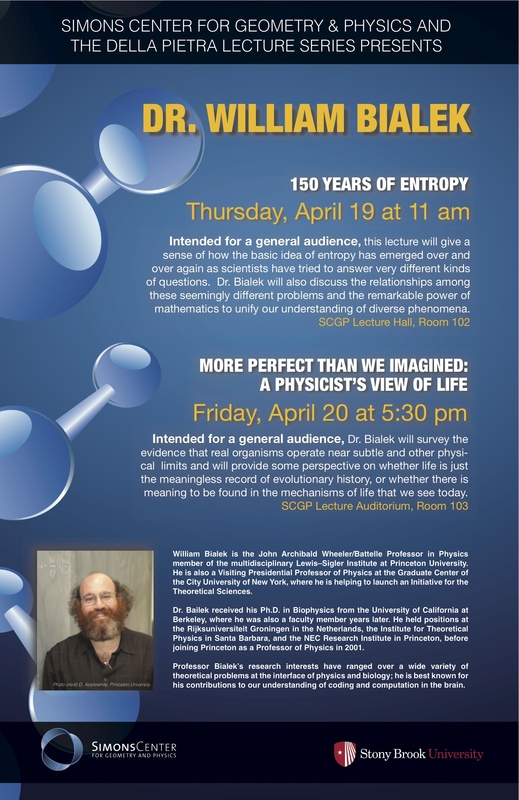 On Thursday, April 19th and Friday, April 20th noted Physicist William Bialek will deliver four talks for the Della Pietra Lecture Series at the Simons Center for Geometry and Physics, Stony Brook University. 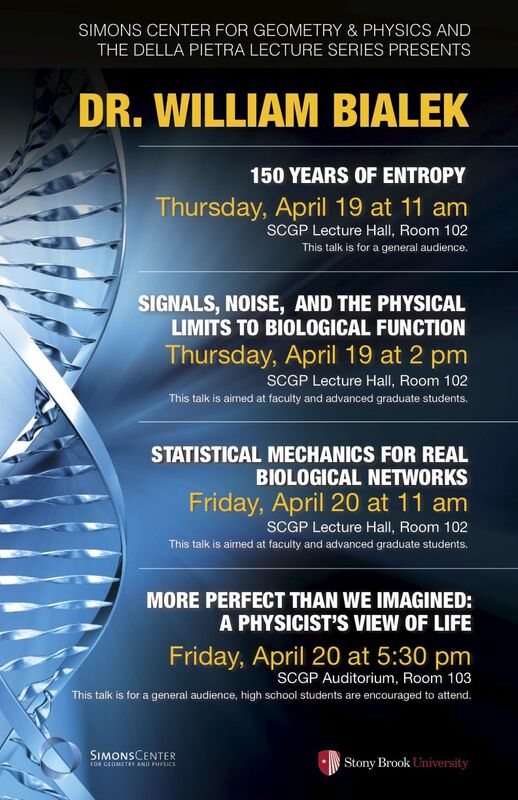 Dr. Bialek’s first talk, to be held on Thursday, April 19th at 11:00 am in SCGP Lecture Hall, Room 102 is entitled, “150 years of Entropy”. Intended for a general audience, this lecture will give a sense of how the basic idea of entropy has emerged over and over again as scientists have tried to answer very different kinds of questions. The capstone talk of this series will be held on Friday, April 20th at 5:30 pm in the SCGP Main Auditorium, Room 103. Entitled “More Perfect Than We Imagined: A Physicist’s View of Life” this talk is intended for a general audience and high school students in particular, Dr. Bialek discusses whether life is just the meaningless record of evolutionary history, or whether there is meaning to be found in the mechanisms of life that we see today. Dr. Bialek will also deliver two technical seminars open to faculty, advanced graduate students and those with a background in the advanced sciences. 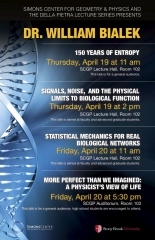 “Signals, Noise, and the Physical Limits to Biological Function” on Thursday, April 19 at 2 pm in the SCGP Lecture Hall, Room 102 and “Statistical Mechanics for Real Biological Networks” on Friday, April 20 at 11 am in the SCGP Lecture Hall, Room 102.
has emerged over and over again as scientists have tried to answer very different kinds of questions. remarkable power of mathematics to unify our understanding of diverse phenomena. entropy idea, make it possible to construct statistical mechanics models of biological systems directly from real data. Intended for a general audience, Dr. Bialek will survey the evidence that real organisms operate near subtle and other physical limits and will provide some perspective on whether life is just the meaningless record of evolutionary history,or whether there is meaning to be found in the mechanisms of life that we see today. Click here for more information on William Bialek’s Talks for a General Audience. 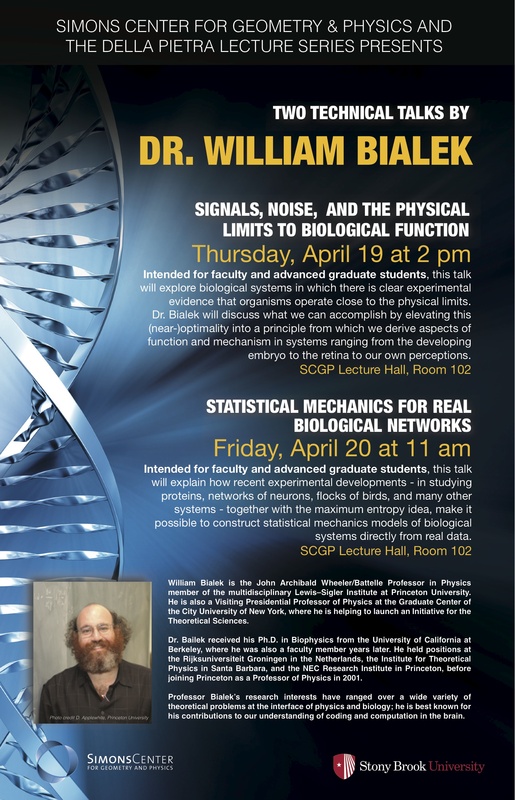 Click here for more information on William Bialek’s Talks for a Scientific Audience.